Commercial codes may be frustrating, but they’re vital to maintaining a safe and healthy work environment for you, your customers and your employees. It can be tough to keep up with rapid changes in the code, however, and even the most fastidious business can miss something in the hustle and bustle of doing business. That said, you’re still left with the problem of getting your systems and equipment up to code when you’re experienced a violation, and for that, you need a service that knows what it’s doing: not only able to address the problem, but to understand the new codes behind the problem and how best to meet them. That’s a job for Embrich Plumbing Co. Our staff is trained and experienced to dealing with commercial plumbing and appliance issues of all varieties. But more than the repairs or upgrades themselves, we’re knowledgeable about all applicable commercial codes and statues in Collinsville, IL, so you can be sure that our services will do the job right the first time, every time. Give us a call today and let us know how we can help! Trust Embrich Plumbing Co for commercial code violation services in Collinsville, IL. For restaurants and food preparation businesses, keeping up to code can be exasperating. No business wants to be in violation of code, but it does happen. Keeping up to code can be made easier with a qualified plumbing repair service on your side. While you focus on the purpose of your business – be it a restaurant or some other food–preparation industry – we keep up with the latest changes in plumbing and utility codes to make sure your Collinsville, IL business stays informed. With regular maintenance you can make sure your business is never in violation, and when you need your property upgraded to stay up to code, we’re ready to help! When you need commercial code violation repair service to step in, the goal is clear: you need repairs that will not only meet the requirement for the law, but will do so in a way that will stay up to code for a good length of time to come. When Embrich Plumbing Co arrives on–site, we will make a swift and accurate assessment of the issue and recommend repairs based on both our experience with the issue and our knowledge of the existing code. That way, the problem gets corrected the first time, every time, and your enterprise can get back to business without worrying about whether it meets the code. If you get hit with a code violation, it can feel like the whole world is out to get you. Fortunately, you have an ally on your side who has the knowledge to handle the issue properly and whose services are just a phone call away. Embrich Plumbing Co has served the Collinsville, IL area since 2001, and we pride ourselves on quality service to commercial enterprises throughout the area. 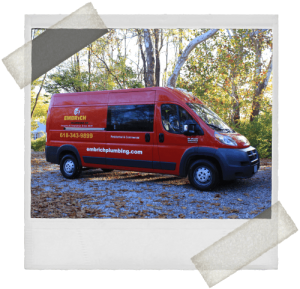 If you need timely experience and expert skills in dealing with a plumbing issue, call us day or night. We’ll be there in a flash!